Improve your mental health in just minutes a day, from trusted senior resource AARP. 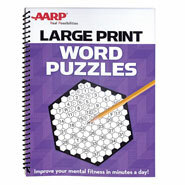 AARP large print crossword puzzles are easy to see even with visual impairment. 40+ puzzles provide hours of entertainment! Use clues to fill in words and complete puzzles. Spiral binding ensures pages lie flat. 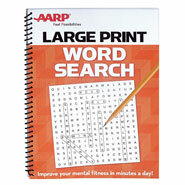 Large crossword puzzles are ideal for use on a lap, tray, table and more. 96-page book measures 8 3/16” x 10 7/8”. I am a member of AARP and I like their other products and services. Also, the large print format will be helpful to my 86 year-old aunt who is losing her eyesight. Large print and spiral bound makes it easier to use. My eyesight is not so good. I purchased this 'large print' puzzle book for my 80-something year old aunt. She has macular degeneration and can only read larger print. Since she loves to do crossword puzzles, I selected this particular book for her. I like doing puzzles and this one is created by AARP, and as I am a senior hoping to enjoy this 1. Large print and spiral bound. I wanted some crossword puzzles that weren't too easy. All the books I could find in the store were easy crosswords. The puzzles are challenging and I like big print. 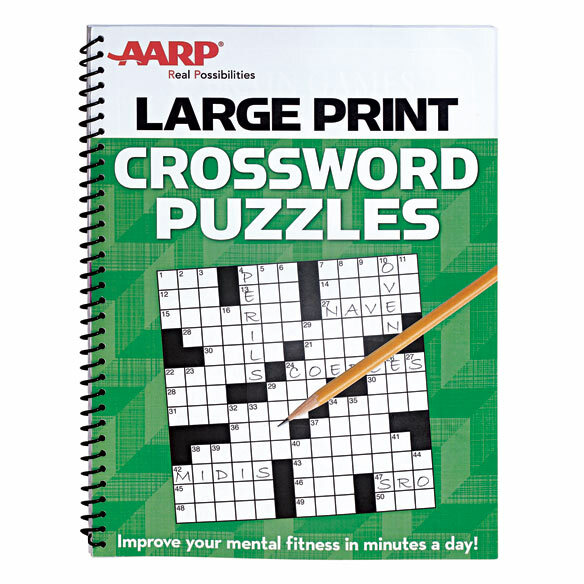 Eyesight dimming and enjoy crossword puzzles. I love crossword puzzles; they stimulate my brain. For mother, 92 with dementia. I'm addicted to crossword puzzles! these puzzles are very entertaining and make you use your brain. I love crossword puzzles and was happy to find large print. My mother loves crosswords but has low vision and macular degeneration. I'm sure my mother of 94 will appreciate the large print. Love to send her little surprises.Thanks for offering these puzzle books. I love to relax with puzzles and the large print ones, which I prefer, can be very scarce to find in the local stores. I'm hoping the print is large enough for my 98 year-old mother to see. BEST ANSWER: The level of difficulty varies. As you finish more puzzles, they get a little bit harder. The first are relatively simple, then they increase in difficulty. It's not the New York Times, but it is in big, clear writing, and the puzzles are fun! These puzzles are mostly intermediate with a few a little more challenging. Not too difficult for most puzzlers. This book does not replace the Sunday New York Times puzzle, but it does contain decent puzzles. what is the level of difficulty of these crossword puzzles? BEST ANSWER: The puzzles are easy to medium hard. There are several types of puzzle games. It is worth the money. This puzzle is very entertaining waiting in waiting rooms at the doctor's office. It has been awhile since I did these puzzles, but I would say there were medium hard. Are the answers given anywhere in the book? BEST ANSWER: Thank you for your question. Yes, the answers are in the book. We hope this information will be of help to you. What is the font size of the clues? BEST ANSWER: Thank you for your question. The font size is 16. We hope this information will be of help to you. how do i do the puzzle right now?